In this wisp of a narrative, a humpback whale becomes entangled in a discarded fishing net and is set free by a team of intrepid divers who descend beneath the surface of the roiling sea to slice through the web of ropes. 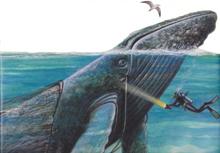 Though the tale itself is affecting, the most engrossing material has been saved for the afterword: the fact that this is a true story; why the nets are so deadly; and a smorgasbord of interesting humpback facts (such as the eye-opening comparison that an adult’s lung can be “the size of a small car”). In both sections, Guidall’s fine narration matches Wendell Minor’s dramatic illustrations with the gradual crescendo of his own well-paced recitation, then shifting gears to deliver the factual paragraphs in a more genial and informal tone. This package will be useful in early elementary classrooms as an introduction to these gentle underwater giants as well as a good discussion starter about mankind’s roles and responsibilities in the natural world. Narrator George Guidall's rich voice is a pleasure to listen to as he captures the majesty of humpback whales traveling in the vast oceans. He sets the scene with drawn-out phrases punctuated by musical and aquatic sound effects. When the whale is entwined in a net of thin threads, struggling to free herself, he alternates his broad narration with clipped and urgently voiced phrases. In the final section, detailing her rescue, Guidall adds an authoritative tone. Listeners will share Guidall's wonder in the amazing climax. The production concludes with information on the event that inspired the book, humpback whales, whale rescue, whale song, and the importance of protecting marine life.